Don’t burst Hope Carter’s bubble. Seriously, don’t do it because if you do, she’ll have to start the process all over again, and it’s cold outside. 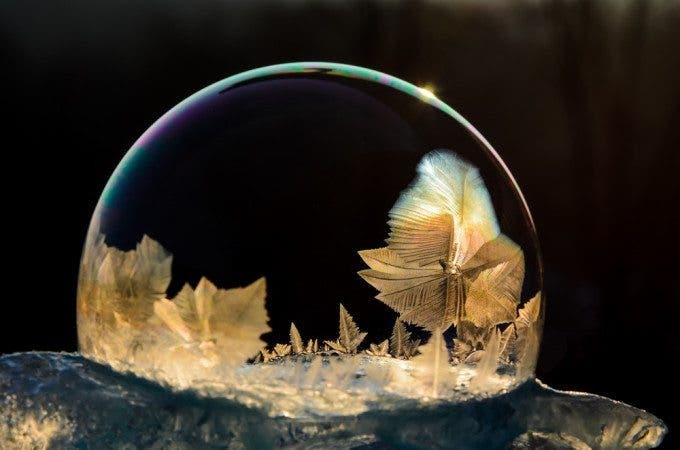 Carter has been experimenting with the very precise art of photographing bubbles in freezing temperatures, which was inspired by some classes she helped teach in her children’s schools. 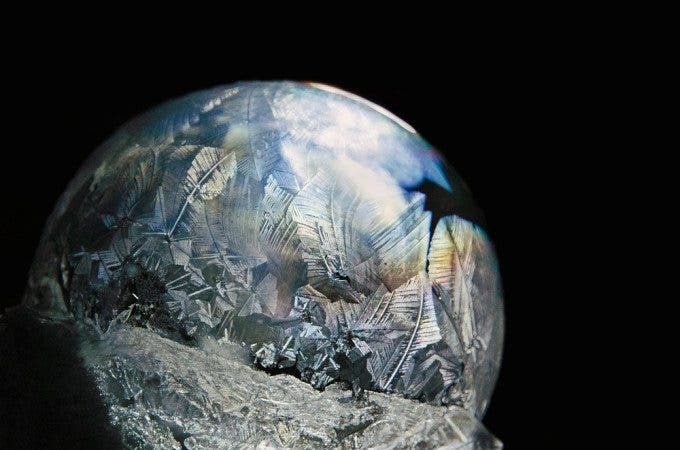 She took camera into the freezing outdoors, where she would blow bubbles that would then crystallize, and before they disappeared, she clicked the shutter. No two bubbles are alike. Each gives rise to a different kind of icy landscape. Here we interview Carter about her series “Frozen Frosted Fun”, and for more of her work, check out her website. Hope: I was exposed to photography at an early age as my mother has dabbled in it for years. My first SLR camera, a Nikon FM, was given to me as a college graduation present and from there my love for photography really began to grow. It has been only recently (the past 5 years or so) however that I have had more time to devote to learning and concentrate on developing my skills. One of the many things I adore about photography is that there is always something new to learn and also the fact that creative possibilities are endless. Phoblographer: Talk to us about how you get inspired for your various projects and something like Frozen Frosted Fun. Hope: I was an “at-home” mom for many years raising 3 boys and one of the activities I enjoyed the most during those years was volunteering at their schools. Several other mothers and I taught a “Mad Scientist” enrichment class, where weekly we conducted all sorts of experiments with the kids. I’m not sure when it happened, but somewhere along the line it dawned on me how fun it would be to try to start photographing these types of “art”. My love for science, the outdoors and color are where my interests lie. I read a lot and of course the internet is full of ideas. The age of digital has really made experimenting so affordable and for that I’m thankful. When talking to others about photography I always say at the end of the day, do what you love, what speaks to your heart. I have been asked to shoot weddings and decline every time – they scare me (couldn’t imagine the pressure!) and it’s just not my thing. Now exploding color, I could play with that all day long…. Phoblographer: How were these photos done? Hope: I got the idea to blow bubbles outside in the winter when I saw several photos on the internet last year. I was instantly intrigued! So of course I had to run out and buy some bubble solution and try it out first hand…little did I know what it really entailed. The first and foremost ingredient in doing anything like this is patience. This is critical! Folks don’t realize this because they only see the end result, not the countless trial and error setups, the frustration of popping bubbles, blurry ice crystals and of course frozen hands. Weather conditions to produce this type of photo are key. I’ve found the ideal outdoor temperature should be between 10-15 degrees and there can be no wind, not even the slightest breeze. 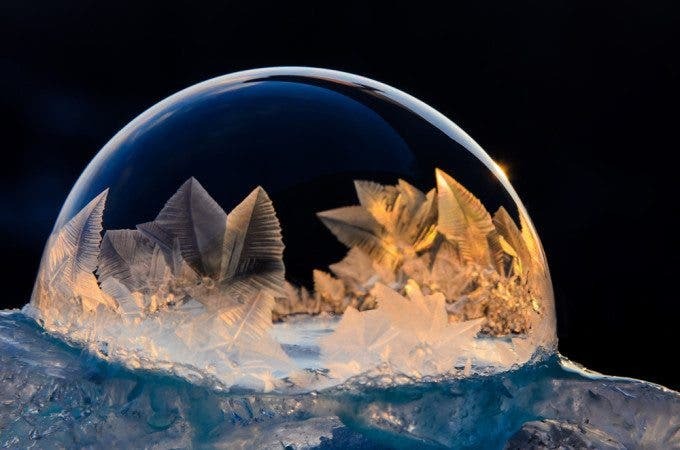 Then it is a matter of blowing the bubble, checking where the light is most effective to capture the crystals as they form and shooting it quickly as the ice crystals develop rapidly. Hopefully this can all be done before it pops, because then you will need to start all over (and over and over)! 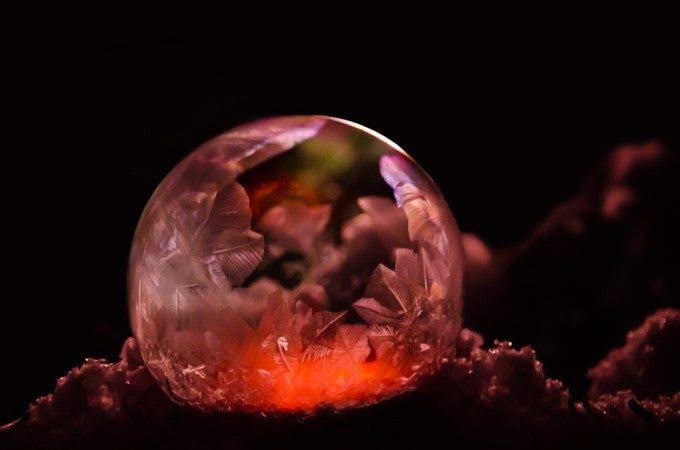 What is so exciting and rewarding though and why I just adore the challenge is that every bubble forms differently each time, so you never know what you’re going to get. I love the element of surprise in life and this type of experiment fits right into that category for me! Hope: I have always used Nikon cameras (simply because I grew up in a Nikon household). Currently I’m using a Nikon DSLR (cropped sensor) and am just about to upgrade to a full format camera. I also use a Manfrotto tripod, absolutely essential! Finally I recently purchased a ThinkTank backpack and couldn’t be more pleased with it. I use Lightroom (love Lightroom!) and Photoshop as needed.